…and a little LOST cheese. 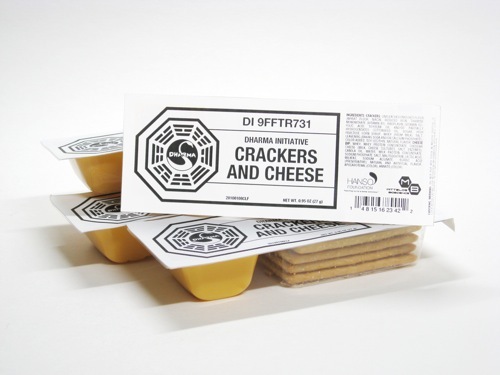 For those small, savory, need-a-stick snack urges, the DHARMA Initiative has you covered—try DHARMA Initiative Crackers and Cheese. DI Crackers and Cheese might just be the snack for a LOST Season 6 premiere viewing party! If not, there are many more items at our LOST labels for your DHARMA Initiative needs. This entry was posted on Thursday, January 28th, 2010 at 6:00 am	and is filed under Film/Video, Food, Graphic Design. You can follow any responses to this entry through the RSS 2.0 feed. Responses are currently closed, but you can trackback from your own site.